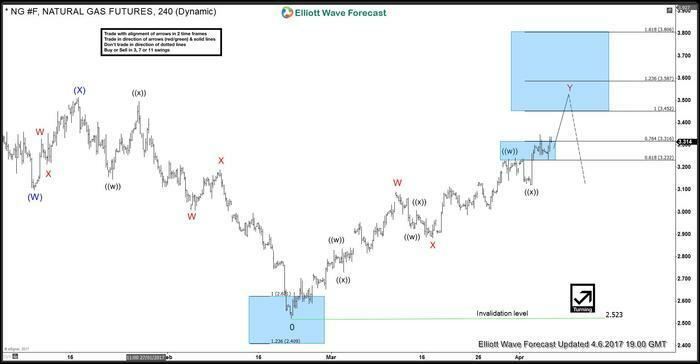 Rally to 3.237 completed wave ((w)) which was followed by a FLAT correction to 3.121 which completed wave ((x)). Up from there, it rallied in 3 waves to 3.347 to complete wave (w) and then did a 3 wave pull back to 50 Fibonacci retracement level at 3.234 which we think completed wave (x). Today, Natural Gas started rallying again and now it needs to break above 3.347 (w) high to confirm wave (x) completed at 3.234 and wave (y) higher is in progress. 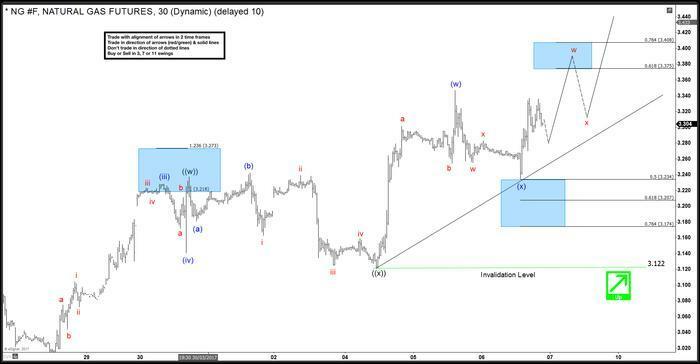 Until 3.347 high doesn’t break a test of 3.224 – 3.197 area can’t be ruled out to complete a double three correction in wave (x). Break above 3.347 would initially expose a test of 3.375 – 3.408 area and from there we can see another 3 wave pull back followed by the next leg higher towards 3.461 – 3.514 area which is the 100 – 123.6 Fibonacci extension area of (w)-(x) and will coincide with 100% Fibonacci extension of higher degree red W-X at 3.452.